LAS VEGAS Nevada - Nonito Donaire (26-1) was in high spirits as he was crowned as the new WBC and WBO Bantamweight Champion of the world after he defeated the mexican boxer Fernando Montiel (44-3-2) via TKO in the last 30 seconds of round 2. The filipino flash has successfully landed a rock-solid left hook that hit Montiel right through the temple putting him down flat on the canvas. Montiel attempted to get back on his feet immediately after he fell but the strike was too heavy he wobbled and fell right back on his knees. The fight was stopped by the official seconds after it was resumed when Donaire threw a couple of punches more. The mexican was throwing precise straight jabs and was able to put down a couple of blows on Donaire in the early part of round 2 before he got caught. This was Montiel's first lost from a filipino fighter and a huge upset as his two world titles was snatched by the filipino flash. 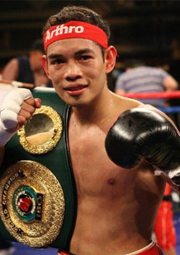 Meanwhile, this is Donaire's 25th straight win and his 3rd division championship title in his boxing career.